What are the Eligibility Criteria for applying these Army Jobs? a).For Soldier Technical: Those who passed in their 10th Class with minimum 45% marks in aggregate & 33 % in each subject are eligible to apply for this particular post. b). Soldier Technical (Aviation/ Ammunition Examiner): All Indian candidates who passed in their 12th class/Intermediate Exam with Science stream having Physics, Chemistry, Math’s and English subjects. Candidates must have 50% marks in aggregate for applying these Army jobs in India. Those who have 3 years Diploma in Engineering under one of the following trade: “Mechanical / Electrical / Automobiles /Computer Science / Electronic &Instrumentation Engineering” from a recognized institute can apply for these Army jobs. c). Soldier Nursing Assistant: Those who have a B.Sc Nursing degree can apply for this post. d). Soldier General Duty: Candidates who passed in their 10th class examination with 45% marks in aggregated minimum 33% marks in each subject can apply for these army jobs in India. e). Soldier Tradesman: Candidates who passed in their 8th class examination from a recognized education board can apply for this post. ITI Pass out candidates are also eligible to apply for these posts. f). Soldier Store Keeper : Those who scored 50%marks in each subject and 60%marks in aggregate in their 12th class examination can apply for these posts. Age Bond: Applicants age must be in between 17 years 06 months to 23 years for applying these Army jobs in India. There is no application fee for applying this Indian Army recruitment 2018. Those who passed in their 8th 10th 12th and graduate pass can apply without paying application fee. How to Apply for this Indian Army Recruitment Rally? 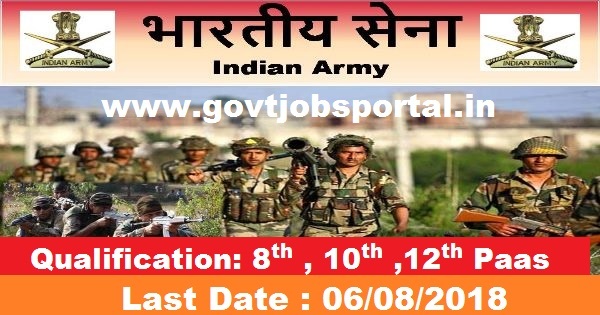 Those who are eligible to apply these Army jobs in India can apply online. The last date for applying online is 6th August 2018. We share the link below related to this recruitment rally. 06/08/ 2018 Last Date for apply online.